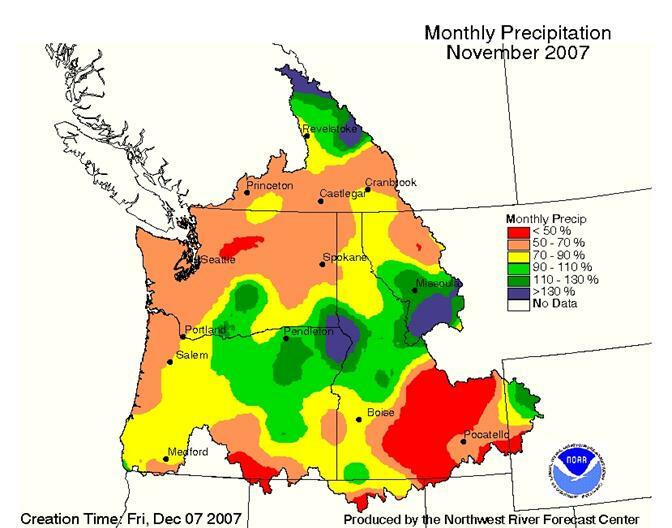 Hydrometeorological forecasters at the NWRFC began to see indications that early December 2007 had the potential to be warm and very wet across the Pacific Northwest about one week prior to the event's landfall. This feature was first described in the Hydro-Meteorological Discussions (HMDs) written on Saturday, November 24, 2007. The key to this initial outlook was the detection of an unusual upstream weather pattern in the far western Pacific. 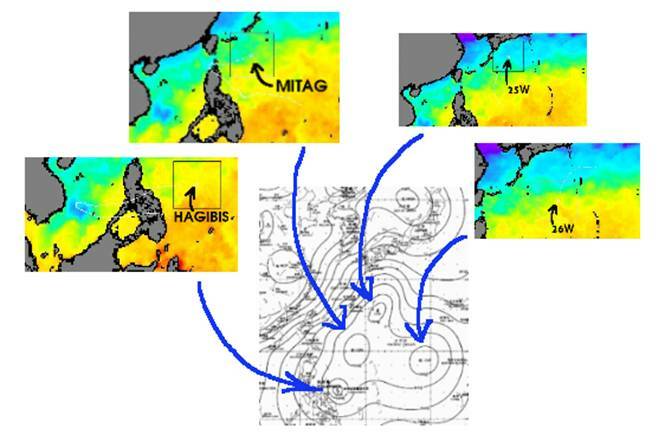 The remnants of two former Category 2 typhoons (Typhoons Hagibis and Mitag) essentially merged together with the lesser remnants of two dissipating subtropical depressions (25W and 26W) in the southwestern Pacific (see figure 1). Figure 1 Late November 2007 western Pacific tropical storm remnants. The merging subtropical moisture in these features gradually drifted northward becoming entrained in a progressive westerly mid-latitude storm track.The left image in Figure 2 shows the source area of subtropical moisture in the western Pacific on November 26 prior to being entrained into the jet stream. 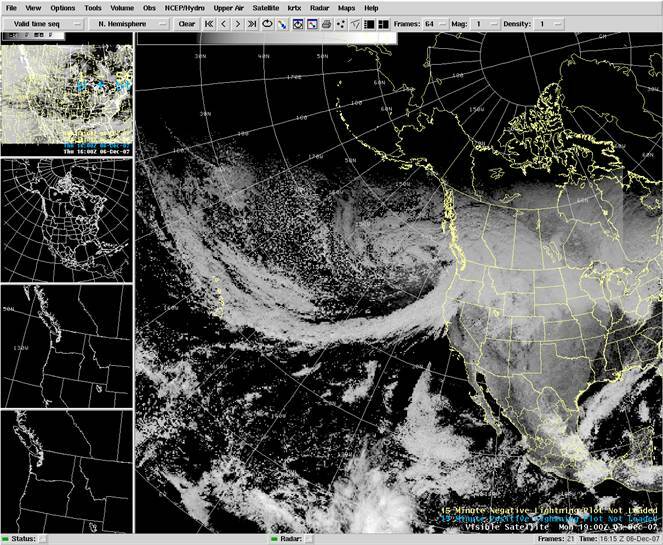 The right image shows the entrained moisture plume when it reached the west coast of North America in early December. Figure 2 Late November to early December focus of tropical storm remnants. As this subtropical moist unstable air approached the west coast of North America, the former tropical storm remnants became integrated into two rapidly developing and closely linked Eastern Pacific mid-latitude storms.The first of these two strong storms shifted heavy rain, quickly increasing freezing levels, warming temperatures, and very strong low level winds into western Washington and northwest Oregon on Sunday December 2, 2007.Prior impacting the Pacific Northwest, the NWRFC was under the influence of a cold Gulf of Alaska trough pattern.With the cold air in place the first strong storm also produced areas of heavy snow accumulation before the cold air was scoured out. Immediately following the first storm the second stronger storm impacted the coast on Monday December 3, 2007 bringing even heavier rain, further widespread freezing level increases, warming temperatures, and extremely strong hurricane force winds at low levels. In fig. 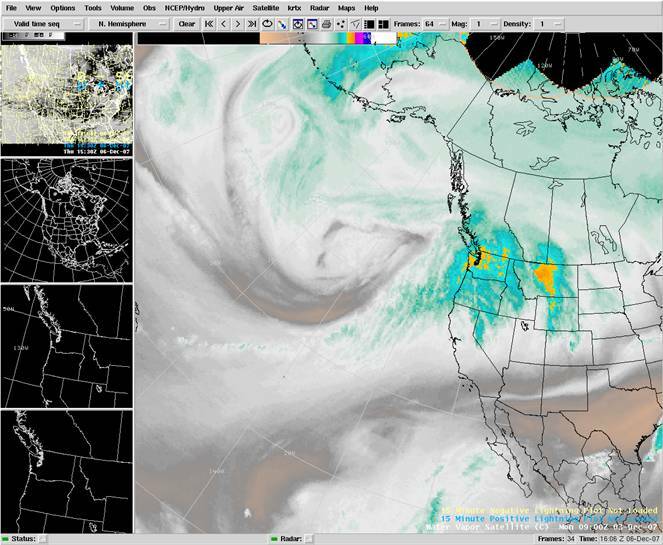 3, water vapor imagery depicts progress of the second, more extensive Pacific storm as it began spreading heavy warm frontal rain across western Washington shortly after midnight Sunday night.The image also shows the initial Pacific storm dissipating across central Montana.Ten hours later, visible satellite imagery (fig. 4) showed the first storm moving through eastern Montana, while second storm was pounding recently saturated Western Washington and Northwestern Oregon basins with even more heavy rain.The warm southwesterly advection continued raising freezing levels, which were well above most summits of the Coast Range, Olympics, and Cascades at this time. Figure 3 December 3, 2007 water vapor imagery. Figure 4 December 3, 2007 1900Z visible satellite imagery. The water content of the snow pack and soil moisture content prior are two major hydrological factors that affect how a watershed will respond to precipitation events. Both of these factors indicate that watershed initial conditions were to the drier side of normal prior to the storm.This reinforces the belief that storm characteristics were the primary factors driving the flood response. Prior to the warm and wet severe weather impacting the Pacific Northwest, the region was under the influence of a cold Gulf of Alaska trough pattern. Between Wednesday November 28 and Saturday December 1, 2007 temperatures fell below normal, causing precipitation to fall as snow below 1000 feet.An additional 1 to 2 inches of snow water equivalent (SWE) accumulated at elevations above 2000 feet across western Washington and northwest Oregon.This minor accumulation of snow added little to existing snow pack that was measuring between 50 and 60 percent of normal at NRCS SNOTEL. 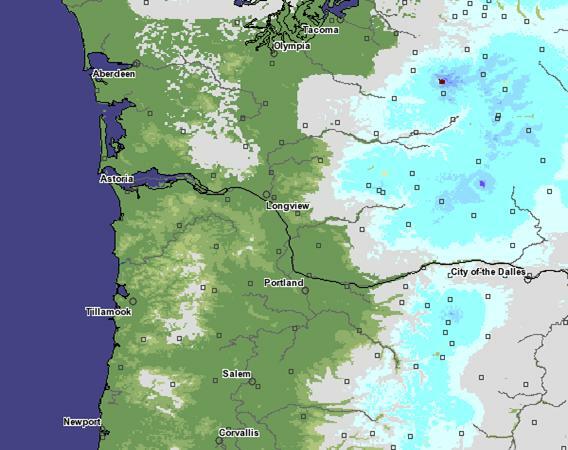 These sites also indicated that there was some snow accumulation down to an elevation of 3000 feet.The NOHRSC also modeled relatively light snow water equivalent (SWE) prior to the storm, especially in lower elevation areas west of the Cascades (see figure 5). 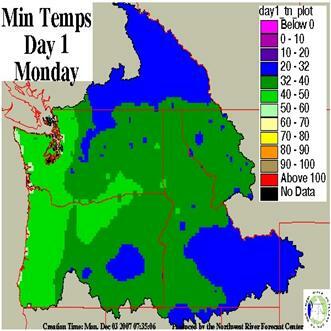 Figure 6 November 30,2007 minimum temperatureFigure 7December 3,2007 minimum temperature forecast. forecast. Figure 8 Saddle Mountain SNOTEL snow water equivalent measurements. 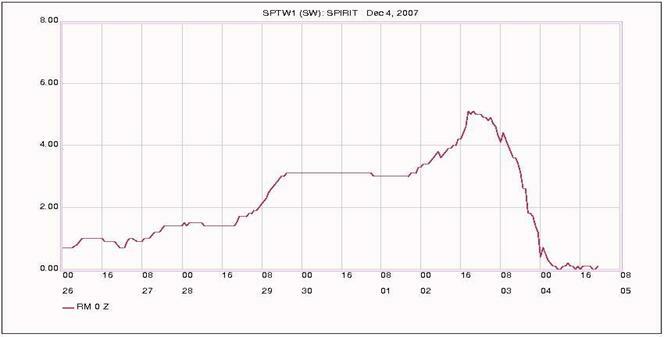 Figure 9 Spirit Lake SNOTEL snow water equivalent measurements. Figure 10SNOTEL snow water equivalent measurements. ripened and then rapidly melt in it entirety.The Saddle Mountain data showed that the entire 9 inches of accumulated SWE was released between 1400Z and 2200Z on Monday, coinciding with the tail end of high intensity rainfall at Lee's Camp.With increasing elevation a higher percentageof the precipitation either fell as snow or was absorbed by the existing snow pack. 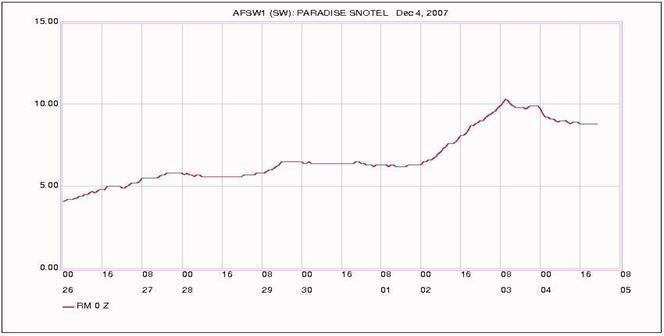 The plot of SWE measured at the Paradise SNOTEL site (see figure 10), which is located at an elevation of 5130 feet in the Washington Cascades, is typical of sites above 3500 feet which show a net increase in SWE. 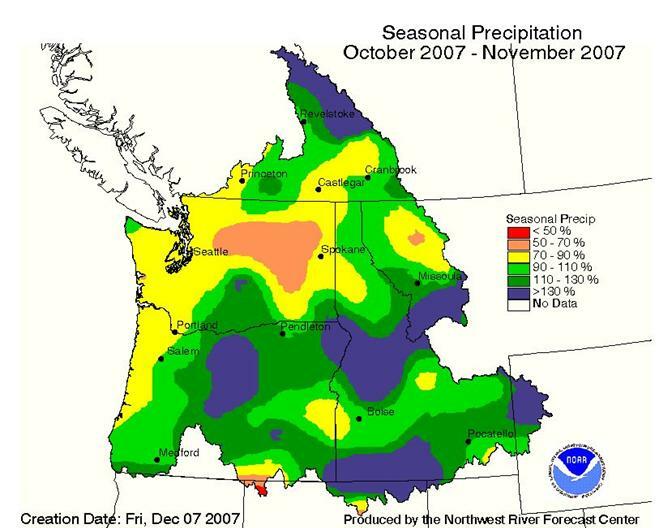 On November 30, 2007 the Friday prior to the December 3rd flood event, observed snow conditions were used to verify the NWS hydrologic river model (NWSRFS) snow states.On that day low elevation SNOTEL sites west of the Cascades Mountains (between 3000' and 3500') generally ranged from 60 to100% of normal. The lowest elevation sites, which had a relatively low average for this time of year, tended to have SWE values that were greater than normal. 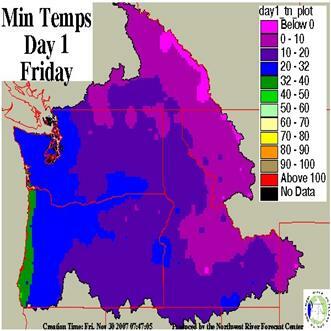 The SWE at these sites resulted from an accumulation during the recent cold outbreak.The highest observations were seen at Spirit Lake at 3120 feet in the Cowlitz River Basin was at 3.1 inches (182% of normal) and Saddle Mountain at 3110 feet in the northern Oregon Coast Range which was 2.0 inches (133% of normal).Model snow states of the lower elevation basins were found to be with the range shown by the observations. Higher elevation SNOTEL sites (between 5000' and 6000') averaged near 60% of normal in the central western Washington Cascades falling to 40% of normal in the southern Oregon.Comparision of the SNOTEL observations with NWSRFS model states indicated that simulated snow water equivalent increases were needed to the upper zones of the Snoqualamie River north to the Nooksack Basin and basin draining the northern Oregon Cascades. Snow water equivalent decreases also were made to upper zone basins in the Willamette Basin.The updated NWSRFS SWE amounts were used in November 30, 2007 river forecasts (Table 1). Table 1 NWSRFS snow water equivalent adjustments made on November 30,2007. Figure 11 November cumulative monthly precipitation. Figure 12 Seasonal cumulative monthly precipitation. Stream flow hydrographs also showed that the soils were relatively drained prior to the storm event.The relatively flat hydrograph for the Nehalem River at Foss, Oregon (figure 13) was typical of rivers west of the Cascade Mountains prior to the event.The hydrograph shows that flow was primarily driven by baseflow.Only two minor rises were visible in the week preceding the event.Flow in the river on November 30, 2007 was around 2500 cfs, well below the mean flow of 5300 cfs. 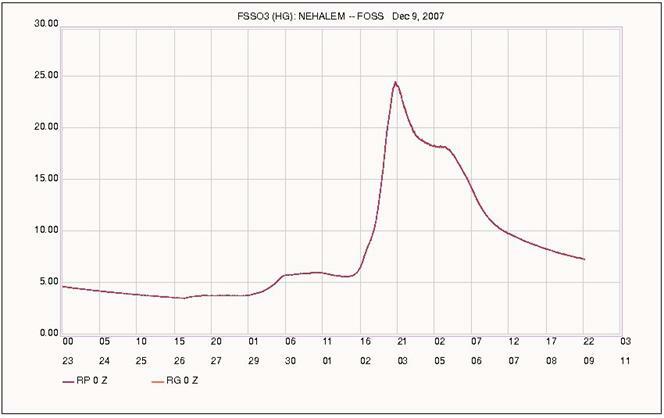 Figure 13 Hydrograph of the Nehalem River at Foss, Oregon.